Polyurethane Pads ? You’ve come to the right source! Urethane Impact Pads: Urethane impact pads are found in almost every application requiring abrasion resistance and excellent load-bearing performance. Our custom urethane impact pads will even hold up to the harsh environment of being media blasted to provide traction for parts being processed. Typically urethane impact pads are made from a high-quality ester based TDI resin. Urethane Vibration Pads: Urethane vibration pads are manufactured to provide a high-quality vibration protection on delicate parts or machines. Plan Tech’s urethane vibration pads are proven for their outstanding properties for tough applications. The urethane vibration pads are available with a tolerance of +/-.010 ideal for customers that will machine parts from the urethane sheet. Saw Tooth Urethane Impact Pads: Saw Tooth Urethane Impact Pads are used in material handling applications commonly found on conveyor belt systems to slow the product movement while absorbing the impact from the product falling off the end of the conveyor belt. 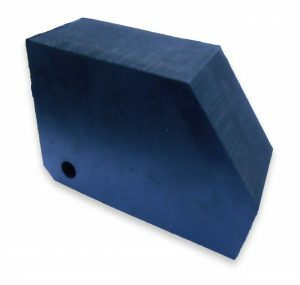 Saw tooth urethane impact pads can be supplied in almost any size or thickness and will have the corrugated saw tooth profile to match the product you’re moving. Corrugated Urethane Impact Pads: Corrugated Urethane Impact Pads are used in material handling applications commonly found on conveyor belt systems to slow the product movement while absorbing the impact from the product falling off the end of the conveyor belt. Corrugated urethane impact pads can be supplied in almost any size or thickness and will have the corrugated profile to match the product you’re moving. 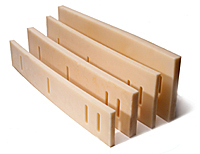 Urethane Wear Pads: Urethane wear pads have been in use since the early 1980’s. Today urethane wear pads are found in almost every application requiring abrasion resistance and excellent load-bearing performance. Plan Tech has a variety of additives that can be added to enhance wear properties, add lubricity, UV stabilized, flame retardant, or to reduce static build up. Urethane Crossover Pads: Urethane crossover pads are an extremely common item to find at construction sites and moving venues like fairs and concerts. Frequently you will find urethane crossover pads in new construction of homes and commercial businesses. Polyurethane pads will be placed over electrical wires or cables to protect the person or equipment from tripping or getting entangled with the wire when crossing. Urethane Vibration Isolators: Urethane vibration isolators are made from high-quality 60A durometer urethane that is chemically designed to last for years while absorbing harsh vibrations from equipment. High-quality precision cut urethane vibration isolators will extend the lifetime of equipment by minimizing vibrations to delicate parts and the operator. 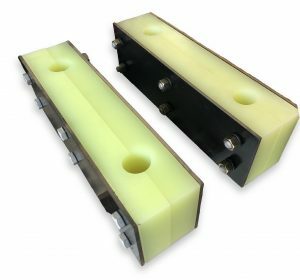 Machine Mounting Urethane Pads: Machine Mounting Urethane Pads are a great choice of material when searching for machine mounting parts. Frequently the mount will consist of a steel core that the complete assembly will mount to. Here at Plan Tech, we have our own in-house machine shop ready to make any custom profile steel mount for your machine. The major advantages of the machine mounting urethane pads include high load-carrying capability, high dielectric strength and non-magnetic with protection against marring/galling with a long life while still offering abrasion resistance with Plan Tech’s polyurethane pads. Urethane Jack Pads: Urethane Jack Pads are custom cast for the most demanding heavy load applications. Urethane jack pads are nonmarking and made from high-quality material that will outlast similar materials. The common hardness of 95A to 60D allows for the jack pad to retain traction from sliding out as it will take the shape of uneven surfaces locking the pad in place. Urethane Press Pads: Urethane press pads are cast from high-quality material in any hardness, color, shape or size. At Plan Tech we have the ability to rapidly produce tooling to accommodate any size urethane press pads for the most demanding applications. Press pads are used in many different applications, most are extremely abusive to similar materials like rubber. Urethane Molded Pads: Our custom urethane molded pads manufacturing line is dedicated to producing both new and replacement custom urethane molded pads. 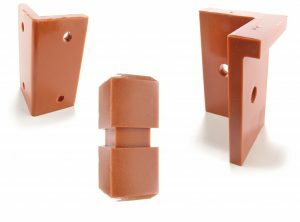 No matter the application you require for your urethane molded pads, you can be assured we will meet your application criteria. Urethane Insulator Pads: Urethane insulator pads are ideally lightweight, soft, waterproof, compact, and efficient and that means they are in very high demand on the market. Like the urethane insulator pads which are renowned for their efficiency, we are also known for being one of the best manufacturers of polyurethane pads. Polyurethane Bearing Pads: We utilize only the best quality polyurethane materials from globally recognized chemical producers to ensure the properties of our polyurethane bearing pads are premium standard. With the expertise of our team of engineers who rank among the best industry and urethane facility that is the largest in the industry, we can manufacture polyurethane bearing pads that meet the requirements of any application. Urethane Stripper Pads: We are proud to say that our urethane stripper pads have impressive wear, abrasion, and chemical resistance. And the ability of urethane stripper pads to withstand harsh environments and maintain unique physical properties after years of repeated usage is second to none in the market. Urethane Forming Pads: The high performance offered by our urethane forming pads is second to none in the industry due to the superior physical properties of our parts. Little wonder the majority of our esteemed customers have spoken highly of the outstanding ability of our urethane forming pads resist wear, chemical, abrasion and corrosion. 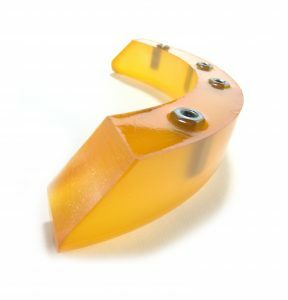 Urethane Gripper Pads: Urethane gripper pads are known to keep your objects in place and save. They also help protect surfaces from wear and tear, which in turn makes them long-lasting. Our urethane gripper pads feature an impressive surface with a non-slip grip. Urethane Coil Pads: These urethane coil pads are produced for virtually any industries; they help reduce the cost of the damaged product which increases overall profit. Normally, each time your product comes into contact with another material you increase the risk of scratches or damage, but with our urethane coil pads, you are guaranteed more durability while your products remain in their perfect condition. 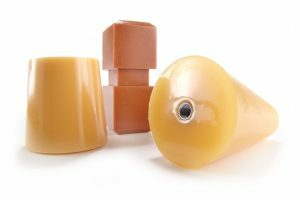 Plan Tech uses the highest quality polyurethane material from world leading chemical suppliers to produce polyurethane pads with excellent physical properties for the most demanding applications. High wear and abuse polyurethane pads are available in any size and configuration with mold making capabilities on site. While most polyurethane pads are soft, high impact polyurethane pads are also very popular commonly replacing UHMW and similar material. Polyurethane pads supplied with a hardness of 75D combined with Armorglide will provide an extended life-span over UHMW parts. Large machine shop and metal part makers prefer harder types of polyurethane pads for high abrasion areas such as a conveyor belt’s exit slide. At Plan Tech we also bond urethane to metal for bolt-on replacement OEM fitment. Amusement park rides utilize polyurethane pads and bumpers for vibration control and are a clear choice when searching for custom molded parts. Please Contact us so we can discuss your polyurethane pads application requirements!